The stained glass window above the sanctuary of the church was designed by John and Theresa Barber in 1984 and erected by Goddard and Gibbs. The frame of the window is made from two of the windows that were taken out of the Church when it was extended. The window was commissioned in memory of Fr. Jack Pledger, a former Parish Priest and features an abstract design representing the Holy Trinity. 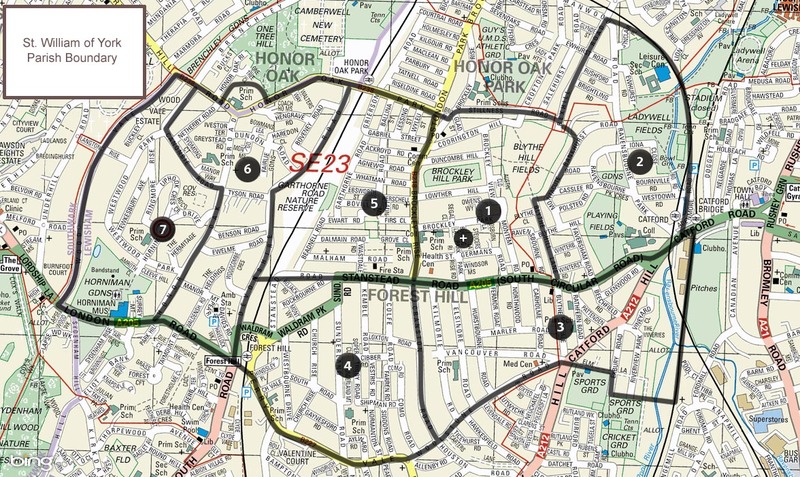 The area now known as Forest Hill was anciently in the Parish of St.Mary the Virgin, Lewisham, in the Diocese of Rochester. After the reformation the mission in England was looked after by the Vicars Apostolic, Forest Hill lying in the London District. In 1850 the Hierarchy was restored and we became part of the new Diocese of Southwark, and were served by the mission at Brockley until 1905 when the new mission at Forest Hill was founded. A lady called Miss Ellis paid for the original yellow brick church. Fr. James Hayes became the first Rector, and the new mission was placed under the patronage of Saint William of York. An early worshipper in our church was St. Francesca Saverio Cabrini, who founded a house of her order, the Missionary Sisters of the Sacred Heart of Jesus, in Honor Oak. She was the first American citizen to become a saint. In 1921 the mission became a Parish, and the Rector became Parish Priest. In 1930 the church was extended by the addition of aisles, a new apsidal sanctuary (now the Lower Hall), a baptistry ( now the Reconciliation Room), sacristies ( now the lobby and toilets for the Parish Centre) and a Lady Chapel ( now the Blessed Sacrament Chapel ). The new work was of high quality and was executed in a dark red brick. Because of the debt incurred by the new extensions, the church had to wait until 5th May 1964 to be consecrated by the Archbishop of Southwark Cyril Cowderoy. You will see four marble crosses on the walls of the Church. These are four of the consecration crosses which were anointed at the time to signify the setting aside of the church as a sacred place. Every year on the 5th May candles are lit in front of them to remind us about the special nature of our building. After an experimental re-ordering for a couple of years in the early 1980's the church was extended, adding the new sanctuary, the liturgical space was reordered and a new Parish Centre was built by splitting the old sanctuary area into two floors and building on top of the old sacristies. The central focus of the new sanctuary is the limestone altar, which was consacrated by Archbishop Michael Bowen in 1986. The altar, flanked by the Ambo proclaiming the prominence in our assembly of the Word of the Lord, reminds us of the centrality of the Eucharist in our Christian lives. These two items of Sanctuary furniture, together with the Presider's Chair and the Credence Table were designed by David John. The window behind the sanctuary is made from two of the original windows taken from the wall which made way for the extension. The window, an abstract design representing the Holy Trinity, was commissioned in memory of Fr. Jack Pledger, a former Parish Priest. Underneath the altar is a bronze reliquary, this contains the relics of two third century roman martyrs St. Marian and St. Septimus, as well as those of our Patron Saint. The practice of having relics beneath the altar is an ancient one, deriving from the practice of the early Christians who celebrated Mass secretly on tombs in the catacombs in Rome.